Understanding your behavior, and how others interpret it, answers a lot of questions. Like “Why doesn’t she listen to me?” or “Why does he drive me crazy?” If you’re an Implementing Conductor in a group of Supporters and Promoters, chances are you’ll hit some rough patches now and then. You’re likely to get impatient. They’re likely to feel intimidated. Communication and collaboration can shut down. 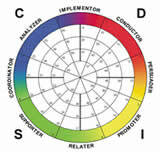 The DISC assessment helps people understand and accommodate each other’s behavioral and communication styles. They also learn the value each communication style brings to the team, as well as pitfalls to watch out for. And managers can customize the way they manage and motivate their people to help them maximize performance. You can bring your team or entire staff together using their profiles in a Team DISC Report to create an experience that’s both informational and fun. If everyone you work with understood everyone else’s DISC profiles, their tendency to make up stories about why so-and-so does such-and-such would all but disappear. Instead, everyone could spend their time and energy on things that matter, like working together to exceed goals.